Details really matter when it comes to your car. What�s the point of having a clean, waxed and detailed ride if your car mats are dirty? 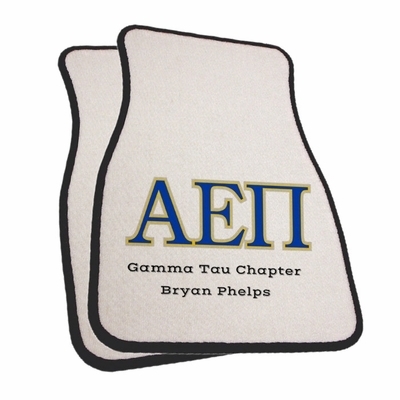 Replace those muddy worn out floor mats with a pair of new personalized car floor mats from Greek Gear. These design your own car mats come with a white background, bordered in black, with your chosen design imprinted at the center. Many customers like the design as shown -- colorful Greek letters and two lines of text, but you can change things up as you see fit. Create and make your own car mats that are inspired by your vehicle (color/style/model) and your school or chapter. Every time your friends jump in your car at school they'll be reminded that they're riding with a proud member of the Greek college community when they check out your design your own floor mats. Each order comes with a pair (2) that will fit the front of your car. You could also use these as welcome mats at your dorm.